The L.A. County Fair returns this fall from Aug. 31 through Sept. 23, and you can take Metrolink straight to the fairgrounds. Weekend trains on the San Bernardino Line will make additional stops at the Fairplex Station, located between the Covina Station and Pomona-North Station. CONTEST ALERT! Metrolink will be holding daily weekday giveaways of tickets to the L.A. County Fair from Aug. 20 – 31 via their social media channels. Check them out if you’re interested in participating. Metrolink and LACF will also be hosting a petting zoo at Union Station on Wednesday, Sept. 5 from 6 to 8 a.m. Stop by the East Portal for photo opportunities with baby animals, fun prizes and Metrolink train information to the Fair. 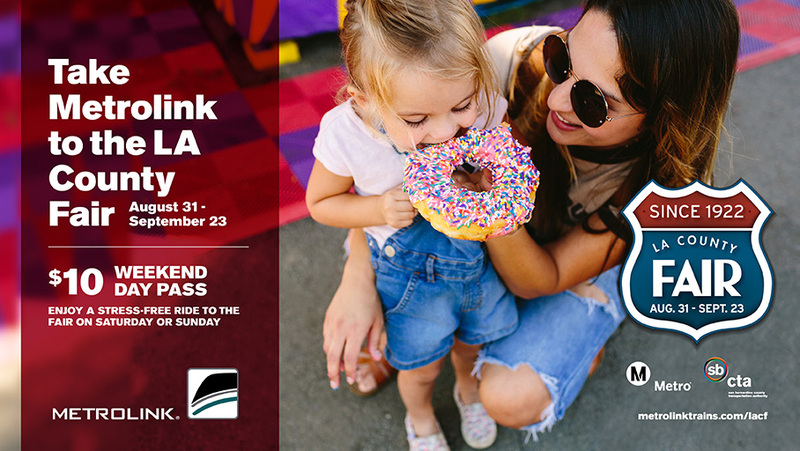 Purchase a Metrolink $10 Weekend Day Pass to get to the L.A. County Fair on Saturdays and Sundays only. Metrolink will also offer special Labor Day service to LACF on Monday, Sept. 3. Trains will operate on a Sunday schedule on Labor Day and make stops at the Fairplex. Metro riders can connect to the Metrolink San Bernardino Line at Union Station. Another option is to take Foothill Transit. Ride to the fair on Line 196 or 197. Line 196 connects to the Metro Gold Line at Azusa Downtown Station, and you can use Stored Value on your TAP card to make the transfer. To find more routes and connections, use the Trip Planner at metro.net.